As I posted a picture of Chile (who is doing fine btw), I thought I had best post a picture of the Border Collie, Joss. Labradors are laid back, Border Collies are manic. They have one track minds, and having done something once on a walk, they assume they will always be going in that direction. Joss who is named after Joss Naylor, the legendary fell runner is a wonderful dog, but he is never happier than when he is out for a run. His main job in the house is to round up the ducks at night. He does not bother about sheep (thankfully) but ducks are his responsibility. Unlike Chile, he is not pedigree and comes from farming stock. Or rather his father was a sheep dog that jumped off the back of a quad bike one day. His mother was a family pet (and apparently a bit nervy) Joss tends to be nervous around big machines as he went exploring as a very young puppy and encountered a tractor. Would I get a Border Collie again? Probably not. They need bags of exercise and walks can be stressful as they want to be doing something. Walks are not just an opportunity to get out, but to do. But he is a wonderfully loyal dog...if a bit manic. The children adore him, even if the ducks and hens don't. The wip is getting better, but still going slowly. Some day, it is going to be a really good story but at the moment, it has its faults. I have forgotten short scenes. And for those of you who are interested in travel programmes, the BBC 4 Travel century with Benedict Allen continues tonight with a focus on Laurie Lee. Merrimon Crawford has penned a lovely review of Viking Warrior, Unwilling Wife for the Medieval Book Reviews. If you are interested in medieval romance, and have not visited, do. You are sure to discover a book or two to read. VIKING WARRIOR, UNWILLING WIFE has a perfect combination of highly-charged tension and tender intimate moments amidst the political maneuverings of outside forces. Michelle Styles gives readers a beautiful portrait of a second chance romance, a more mature love in which a man and a woman learn to trust each other and themselves more intimately than ever before. A striking romance! Chile continues to evade pills unless they are wrapped in Gorgonzola. A dog with expensive tastes. And he is having to wear an Elizabethan ruff collar as he began to worry his paw. And to make matters worse, he went outside yesterday and promptly went in the stream. I had to disinfect his paw with hippie scrub. SIGH!!! The wip is improving, but going slowly. Another sigh. BUT Francesco is on for an hour tonight. And it should be pure bliss to watch. Yesterday, the Labrador, Chile had to go to the vet. He has a tendency towards lumps and bumps (the scar on his nose is from a red wart when he was about 6 mos) and had grown a wart between his digits on his right paw. Besides, the usual anxiety, I felt bad because I had assume arthritis. The Pedigree chews he has every day seemed to help and I simply assumed. To be fair the wart was not visible unless you spread his paw out. But the vet asked if I wanted it sent off for examination and I decided no, I do not want to know if the cancer he had removed two years ago has returned. He is a happy dog, enjoying life and when he no longer enjoys it, then it is time to take steps. Cowardly -- perhaps. But I am convinced it is the right decision. Yesterday as part of my youngest's birthday celebrations, we went to see The Dark Knight. Although I have enjoyed Batman for years and liked Batman Begins, I found this latest installment far too dark and gruesome. I really thought that it lacked humanity. There were parts that I had to close my eyes and wince away from the screen. It is not a children's film or even really a young adult film. The themes are far too mature. Now I know that Blake Snyder has gone on about it being beat perfect etc etc, but I did not think it was. I found the film dragged, particularly at the end and that there were too many threads. As my dh said -- there was one too many crash bang whallop. In particular, he felt the thread about the Chinese businessman went nowhere as did the thread about the Wayne employee. The film could have been about 45 minutes shorter without losing its punch. I had no empathy with the Joker as he merely existed to kill and cause anarchy. I know people have spoken about Heath Ledger's last role and there is perhaps an argument that the role contributed to his untimely death as it may have sucked the life out of him. It can not be easy to play that sort of psychopath. But his stakes and motivations in the film are never clear. What does he hope to gain from killing Batman? Why does he need to expose Batman's face when he never exposes his own? Why does he hate Batman? Why are his followers attracted to him as he kills them once their job is finished? With the Jack Nicholson Joker, you could at least see some of the why, even if it was twisted and warped. Equally with Batman, there should have been more Save the Cat! moments. Yes, everyone knows -- he is a superhero, but he is also supposed to be in love with Rachel. Where were the little touches? The photo? Or symbol? The humanity that Bale brought to Batman Begins is missing from this one. You only get Alfred and Lucius Fox. What is driving him at the moment? Is that he wants to rid the city of crime? And why? If it is so he can hang up his cape and ride off into the sunset with Rachel, where are the hints? Where is the longing? What is at stake for him personally? How does he see his future? Some of this could have been easily shown. Because the full emotional colour wheel was not employed. the movie just feels dark. It reminded me of what Donald Maass once said about the problem with midlist authors who write this wonderfully troubled hero and say it is the best thing they have ever done, when really they just need to spend some time with a therapist. The hope is gone and that is not a good thing. Anyway, the film did not work for me and I did not feel emotionally satisfied at the end. It did work for my daughter who loved the Gothic elements. It is a huge blockbuster, but it is not a film that I will be in any hurry to see again. Alice asked in the comments a few days ago about creating a logline for a romance novel, inparticular as Save the Cat! mentions that you need an adjective for a villian. Many category romance novels do not really have a true villian. The emphasis is on the growth of the emotional relationship. HOWEVER, there is always a conflict between the hero and heroine. And you can show this in a few words. For example with Viking Warrior, Unwilling Wife, the logline might be -- To save her son, a strong willed woman must join forces with the one warrior most capable of destroying them both -- her former husband. So you want to show that there is going to be a conflict worth sustaining, and that the book fits the genre you are writing in. It is a matter of knowing your hooks. The logline in romance is really the middle paragraph of your query letter. You do have more than a single sentence.But if you can make it nice and pithy, you do give the editor somewhere to hang her hat. Right because Anne McAllister was wondering, I went searching. Where exactly did the list of top 100 books come from and did it have anything to do with the National Endowment for the Arts? It is a bit like trying to play a game of Chinese whispers. The list as far as I can determine comes from the 2007 World Book Day poll of top 100 books after people were allowed to nominate 10. You can see the full list and the telegraph article here. It would appear that someone did it as meme and it has circulated basically unchanged except for the intro. There were/are two Big Reads. The UK Big Read happened in 2003 and was sponsored by the BBC and the govenrment and was aimed at finding the nation's favourite book. In 2003, LOTR came out top. The Big Read in the US is sponsored by the National Endowment for the Arts. It is the largest Federal programme since WPA and you can read about its aims here. It mainly revolves around trying to get communities to read for pleasure and to read more literature. This is an ongoing project and appears to be based primarily in the Midwest. They do have a list of books which includes Steinbeck, Hemingway, Willa Cather etc. Communities read one book and discuss that book. I do not know where or how the two things became combined, but still contend the list was worthwhile...and fun. My youngest officially becomes a teen this year.In fact today. 13 years ago, it was decided that the babe was cooked and I should be induced. So he arrived a couple of weeks early. The day with its sights and sounds is embedded on my memory. I am so glad that I was able to stay at home with my children and look after them. In the wake of Francesco, comes a BBC 4 series about three great traveller writers of the 20th century --Eric Newby, Laurie Lee and Patrick Leigh Fermor. Last night's episode was on Eric Newby. Absolutely fascinating. Everyone in the family enjoyed it. What can I say except it would be hard to do them justice because their words are so wonderful. If you have not read their travel books, you have not lived. Hopefully Benedict Allen's series will help raise their profile. Equally maybe the BBC will put this on BBC2 so that a large majority of the public can see. Patrick Leigh Fremor is still alive (over 90) and hope remains that he will actually finish his trilogy about his journey across Europe in the 1930s... Sir Paddy served in Crete during WW2 and some of his exploits are recounted in Ill Met by Moonlight. He has been described as a cross between Indiana Jones, James Bond and Grahame Greene. The next episode is on Laurie Lee who is probably best known for Cider With Rose but who also wrote a masterful account of Spain during the Spanish Civil War. Last night, Francesco visited Corfu and the British cemetery. Back in 1991, my dh and I spent a lovely morning visiting the cemetery. It has one of the best collections of bee orchids in Corfu. Anyway, I was about to say -- do you remember George the gardener when there he appeared -- looking a bit older (aren't we all?) and just as charming. He was so helpful with the orchid spotting and explaining about how the flower mimics bees. His words really fostered my interest in gardening and wild flowers. I think he had his medals then, so certainly, he had one. Anyway, it was fantastic to see that he is alive and well and tending his beloved cemetery. I should imagine the orchids are just as lovely as ever. Equally seeing him brought back memories of an enchanted day as later that same day we went to Kouloura and Kalami. 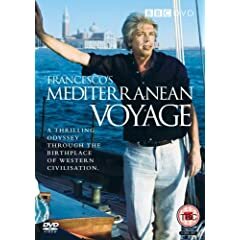 Francesco's voyage continues to be brilliant viewing -- a wonderful dream that is all too short and you have to go back blinking into the morass of reality. I am looking forward to tonight's episode! Oh, and yesterday, my eldest suddenly said -- you know that Spiers and Boden cd? The one with Prickle-eyed bush that you were looking for? It is right here, just under the top cd in the stack. Honestly Mum. He then shrugged his shoulders and disappeared off up into his room. Last night, I watched the Folk BBC Proms. We tuned in late and still managed to see Martin Simpson who was one of my finds of last year. My dd and I have had lots of conversations about his song -- Never Any Good which is from his Prodigal Son album. Personally we figure there was a lot more to his father than the song lets on, and that his mother simply did not understand the father. The album is excellent. Anyway, the last act was Bellowhead with Spiers and Boden who are another favourite. They did a lovely set (confirming why they are a great band to see live) and took awhile to come on for the encore. Just as the credits were rolling they announced that they were doing Prickle-eye bush and then the BBC cut. ARGH! And could I find my CD of Spiers and Boden (Bellow) which has this song on? No. Could I quickly lay my hands on the folk awards album that has this song on? No. Prickle eye bush is the song I listened to over and over again when I was revising Gladiator's Honour, so it has a firm place in my heart. So Bad Bad BBC for not putting it on. But hopefully next year, the BBC will do another folk proms. And will show ALL the encores. One happy thing did happen -- my youngest coughed to where he had put my Run Rig CD. I am not sure why he had it. As I tend to listen to Run Rig when I am revising my Viken novels, this is a useful find. Now all I need is for my editors to get back to me with their thoughts. India Grey's Contest for her upcoming release. I have kept meaning to highlight this. India Grey sent me her latest --Mistress: Hired for the Billionaire's Pleasure. Actually she sent it for my daughter but I nicked and read it while the joiner was putting in the bookcase. It is a lovely, lovely read. It made me cry in several places, and I loved when Rachel was drinking champagne in the churchyard. And Orlando is well Orlando and a hero to die for. I love wounded heroes. Escapism at its best. Anyway, India is running a contest with lots of goodies. You can find out more here. Mistress is her third book. Her second book The Italian's Captive Virgin is out in the US in September. India has a lovely wry voice and there were many heart tugging moments. India is certainly a Modern/Presents star of the future. This is a far smaller brood than I would have expected, so goodness knows if she has lost a few already or simply is a poor sitter. We are not doing anything special to keep the ducklings safe, but if we happen to notice they are in trouble, Operation Duckling will be put into action. My eldest was not keen on the fact that he has already had to rescue the yellow duckling twice. The East India Company continues to fascinate. Most will not appear in any book, but I was intrigued to learn more about General Havelock. The local restaurant/pub is the General Havelock. When he died in 1857, General Havelock was one of the most famous men in England. A statue to him stands in Trafalgar Square. He was responsible for putting down the Indian Mutiny. I am not sure his actions merited the public adulation and suspect that it was more of a case of General Havelock dying so soon after being proclaimed a hero by the media. However, I wish that he reached Cawnpore before the massacre rather than in the immediate aftermath. So much blood. So many wasted lives. Work on my wip continues. Someone, I forget who, asked about beat sheets and what they were. They are part of Blake Snyder's toolkit for plotting the story of a screenplay. One of Blake Snyder's thesis is that all films share certain beats/points. You could say that it is a slight refinement on Vogler's theory. Certainly, it makes sense. Fifteen turning points that all commercial movies share: from the opening image to final image. From the theme stated to the fun and games of the premise realised. It is all about structure and really making sure they are there. You can find a sample of the beat sheet under the tools section on his website. His blog is excellent btw. For example, he does a good explanation of why Indiana Jones 1 & 3 work a bit better than 2 &4. He loved them all by the way, but in terms of Story, 1 & 3 have more going for them. Actually the more I thought about, the more I realised that my books also share the fifteen points. And if I can say what the points are, then I stand a better of chance of having a solid structure. Note: the current Viking does meet the beat sheet test, but I keep wondering IF I chose the wrong B story and IF it would have worked better another way. can you tell I am sitting on my hands waiting for my editors' thoughts and the Crows of Doubt are circling? It is one of those things. Some times, just a different point of view about craft can send your thoughts in a different direction. First of all, the Big Read list is nowhere near definitive. I suspect that there are so many books on there that people have seen as movies for precisely that reason -- movies can give a distorted view of the book. Who do you see as Mr Darcy? Or to name a book not on the list --The Scarlet Pimpernel. Percy Blakeney is fair haired but Richard E Grant who played him in the most recent television adaptation is dark haired. Or perhaps they are books that people talk about. or books that people think they know. I did not say that I loved all the books. Some of the books I had problems with. But that is down to my own tastes. And the books are often very different to the movies/television/popular culture verision. Gordon Brown as Heathcliff anyone? Second, it depends who compiles the book list. For example there is no Mark Twain, Nathaniel Hawthorne or even Ernest Hemingway. You have one Steinbeck. There is no Willa Cather or William Faulkner. Where is Henry James? Graham Greene? Sir Walter Scott? I could go on and on but you get the picture. The intriguing thing for me was that I had read so many of the books. But I suspect that is more serendipity than anything. Third, I like Dickens. A Tale of Two Cities is one of my favourites, but it does take awhile to get into. What it is interesting is that until about the 1930s, he was simply held to be a popular rather than a great writer. In other words, he was writing for the commercial market and it was a very particular commercial market. He does not suit everyone, but I do think he is a good story teller. But the main message should be to read and to read widely. I have nicked this from Amanda Ashby. The Big Read, an initiative by the National Endowment for the Arts, has estimated that the average adult has only read 6 of the top 100 books they've printed. How do you do? 3) Underline the books you LOVE. -- I am not going to do this as I only was intending to procrastinate a little. Out of the 100 possible, I have read 85. Although in some ways, there are two duplicates --Complete Works of Shakespeare and Hamlet as well as Chronicles of Narnia and TLTWTW. And I did not major in English Literature at university so I do not have that as an excuse. I simply like to read and I went through a stage of reading The Classics. I am curious though on who chose the list. It is interesting that most American adults have only read 6 books on the list. I would imagine writers generally score higher. First of all Liz Fenwick in the comments section awhile made a remark about Constance. Constance is by Patrica Clapp and is a young adult book about the Plymouth plantation. It is very good and I believe won several awards. I had not thought of it in years. I am currently reading about the East India Company because my current hero had something to do with India. It is thoroughly fascinating but I had to laugh when the author of the book mentioned that he doubted the tax on tea fanned the republican sentiments in the American colonies. It was somehow a very British remark. I had not realised that Cornwallis went on to serve as Governor- General in India and that his time there was considered a success. Cornwallis is of course the general who surrendered at Yorktown. A few years I surprised to discover that FDR's mother's family had made their money from opium trading. I have finished doing a basic beat sheet for my wip and much has become clearer. The important thing now is to write. But the time has not been wasted. I am simply getting tired of going over the same chapters...It was more that I needed to clear up the back story and to understand what exactly was going on. I think I have it now. I got this from Carrie Lofty and it was too good not to take. I had sort of hoped for Anne Elliot though. 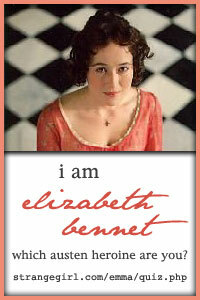 Still if I am Elizabeth Bennet, which Mr Darcy to choose? I do have a theory about the best Mr Darcy being the first one you see on screen and thus, I have a soft spot for David Rintoul. I have been banging on to Donna Alward about this -- yet another light bulb moment from S.T.C. -- the emotional colour wheel. When you are writing about emotion -- you need to cover all the emotional range. Sometimes, it can be very tempting to keep piling misery after misery on but you need to show the triumphant as well. The light as well as the shadow. Actually, it is when the light is brightest that you get the darkest shadows. And if you keep repeating the same emotion over and over again, you lose the impact. Or at least significantly decrease it. There is also the concept of positive/negative. The opening value of a scene must be in opposition to the closing value. BUT if you keep going hope/despair, hope/despair, the reader is going to get bored. So the closing note of the scene must be different from the closing note of the last scene. Otherwise, things feel off and static.. This is where the whole emotional colour wheel comes in. Anyway, I realised where some more of the problems with my current wip lie and think I can fix them. Every manuscript throws up different problems...Ho hum. But at least I am starting to discover why that all important second chapter feels off. Yes, STC may be didactic, BUT it makes you think.Because the joiner put the bookcase in my study yesterday, I decided to a beat sheet for my wip. I continued to work on it when I was waiting for my dd's performance to begin. Suddenly I realised that chapter 3 ended in the wrong place. It had to end on a turning point. It is sort of why parts have felt a bit awkward aand missing a beat. We will not go into the Index Card Incident and why I gave them up...Suffice it say they constrain me far more than liberate. I like my Moleskine notebooks. Right, if you want to blame someone, blame Anne McAllister. 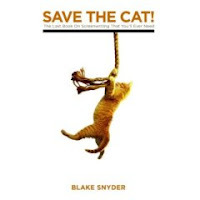 When she blogged about Save the Cat by Blake Snyder, I knew I would want to read it. I also bought the companion piece --Save the Cat Goes to the Movies. And actually STC 2 is good and does help explain more about the needs of various genres and the why behind it. The book is a quick and easy read but details the aspects of story telling, rather than character creation. It has a beat sheet which can easily be transformed into a synopsis. I suspect that it is worthwhile to make sure it can be filled out before you send in your ms and that you are happy with the book's structure. The book has helped me come up with a new working title and therefore, it is useful. It also reminded me of several things. Again useful. And possibly not what he intended, but I will take inspiration when it strikes. The style is far more breezy than McKee's Story. Story remains the bible in many ways for me, but I know many people find it ponderous and hard to follow. The reason why such books work for commercial novelists is that like screenwriters, commercial novelists are concerned with storytelling. It is the driving motivator. It is what makes people keep turning the pages. Or buying the tickets or what have you.In other words, it is an arch plot close ended scenario. And whatever medium you use for the telling, the basic structure does remain the same. Equally because the archetype genres are the same, his break down of genres can be useful. But it is a good book and has lots of helpful exhortations. It is not ground breaking or earth shattering. Swain covered the lot in his Techniques of a Selling Writer back in the 1960s. Some people are simply more at home with one set of examples than others. If you find it easier to dissect movies, then you will get a lot out of this book. One quibble I would have with Snyder is he is a bit too didactic and prescriptive. On page 21, this must happen. As my old editor explained, this sort of thing goes back to Russian Soviet type of thinking. At this point, the peasant must have a cow. Without explaining the why. But he is mainly talking about form and his obersvations can be extrapolated out. McKee makes the point that the tools need to be brought out only when things feel flat and are not working. Snyder likes to start with his tools and his story board. Although he says that a screenwriter needs to be bullheaded, there is not the same exhortation to master the forms that I felt with McKee or Tywla Tharp. However, I suspect that the intent is there. It is only through mastery that one learns. And unless one understands the form, one can not understand the why. The only reason to deviate is to put something better in its place. And equally that sometimes, you just need to write. And if it is not broke do not fix it. Form not formula. There is a subtle difference. Beat sheets , story boards etc are tools that assist and not straight jackets that confine. I suspect in many ways Save the Cat is of more use to editors and those studio executives. In other words, for that time when you are looking for holes and reasons reasons why certain things are not working. But it is more of a fixing a bad page than filling the blank page sort of book. And therefore, authors need to rely on their imagination to create the first draft. The first draft could be a story board btw. Or it could be the actual writing. But at some point the writer needs to create. I found it interesting that Snyder rarely refers back to his story board when he is writing his script. Equally script writing is far more of a group exercise than novel writing. So there is more of a need for a central bible. Also sometimes, it can be useful to know why you are writing certain types of scenes or what the vague missing element is. I understand he is speaking at the RWA Nationals. It will be interesting to see what people make of him. I suspect he is fantastic in person. But McKee, Swain and Maass remain my favourite books. The postman brought a rather large box of books this morning. The paperback copies of An Impulsive Debutante, and the hardbacks of A Question of Impropriety. An Impulsive Debutante looks much nicer in the flesh than on its counterpart on Amazon etc. It was my first peep at QI's cover and I love the feel of it. It does illustrate a scene in the book but more than that it has a fantastic romantic feel about it. Now I simply have to get the books off to various review sites etc. But the excitement of seeing a new book in print never dims. And this time, I had double the excitement. The post about percentages and motivation is at Tote Bags n Blogs where I am blogging today. Gladiator's Honour also appeared in Greek, so it is pleasant to get another book out in that language, particularly as ANC is set on an island a few miles north of Crete.And Phaistos served as a slight model for the temple. As I have said before authors are not necessarily told when their books are coming out in different markets. Sometimes, we only discover the fact when the author copies are sent long after the book has appear. Or sometimes, only when it appears as an entry on the royalty statement. However, I do like knowing and it is always an unexpected thrill when I get a new translation. As a direct result of playing my cd of 1776 on the fourth, my daughter has begun reading various biographies of the Founding Fathers. Now because when we have visited the US, my dh and I have made a point of taking the children to various historic sites, she has visited a lot of the houses where these men live, plus Lexington and Concord. For years. I have tried to interest her in Johnny Tremain which was one of my favourite books when I was a girl but to no avail. Then suddenly, the music has captured her imagination and she had to know more. And she has decided to read biographies instead of fictionalised accounts...as she pointed out she has finished Silas Marner (next year's autumn text for school) and therefore can chose what she wants to read. It will be interesting to see which founding father she leans towards. At the moment, Jefferson intrigues her, but I am hoping to convert her more towards John Adams and George Washington (my own favourites). One thing she pointed out is the strength of the women each of these men married. And how influence they had over their men and how much the marriages were partnerships. I did point out that Ben Franklin's wife was a far more shadowy figure. She replied that she is not so interested in Franklin. It will be interesting to see how deeply she goes into it. Last autumn when they did Custer in history and she had to write a piece on whether or not he was a hero or a villain, she went and read a number of accounts, and finally ended up going to the primary sources and reading Libby Custer's account. Her biggest problem was that wanting to discuss Libby Custer's motivation in great detail. Right now, it is Jefferson's relationship with his daughters that has captured her attention. Anyway, it is lovely to suddenly see an interest take hold, especially as I have tried to nurture it for a long time...For me it is one of the great parts of being a mother -- seeing interests grow, develop and suddenly take wings. Today is the fourth of July and the flags will be going up. I will wear my grandmother's flag pin and generally spend the day enjoying the fact that I am American. Once I met an ex-pat who said that they did not bother, but I have always bothered. I loved the fourth of July as a child and have seen no reason to stop. Even though sometimes, the neighbours have given me odd looks. My children all enjoy the celebration. But we do not have fireworks as they are saved for the fifth of November when it gets dark early. Plus my daughter has never liked the bangs. But I shall be making my seven layer dip, as well as Boston baked beans in the bean pot that travelled to Chicago in the covered wagon in the 1840s. (What can I say except that pack rats run in my family) I shall also make corn bread in the cast iron pan that my grandfather used -- the bread comes out shaped like ears of corn. Like bits of tradition. It helps teach the children about their American heritage. After all they are dual citizens. Hope the day is a good one for all who celebrate. First of all, my tenth book for HM&B Historical was titled yesterday -- Impoverished Miss, Convenient Wife. It is the second part of my Regency duo and has a very hooky title. My editors has concentrated on the heroine -- she is on the edge of her family and she eventually makes a marriage of convenience. Apparently the cover is going to be more female focused. The hero is battle scarred from events in A Question of Impropriety. I like hooky titles and think this one is lovely. It does what it says on the tin. Anyway, I discovered the AuthorMBA blog several weeks ago. It is a weekly dedicated towards giving writers a bit of business savvy. Anyway, this week, there is a piece on four questions writers should think about when setting goals -- productivity goals, marketing goals, work to life balance and refilling the well. Fairly straight forward, but the interesting bit was in the comments when the author of the blog explained that people tend to be motivated by either incentives or accountability. In other words, some people do better when they give themselves treats for completing a goal, and other people do better when they have shared that goal and others know about the goal. What are the consequences of failure v the rewards of success? And which motivates more. I think this is true up to a point. Now I tend to be more productive when I am writing down the number of words and pages I have done per day. I tend to set a per week goal. I do not make charts. I simply write it down in my day timer. It can be helpful to go back and look when I am feeling stuck. It is then that I realise -- that I tend to go slower at certain points and I can still finish. What I do not find helpful is telling other people/groups. National Write a Novel month tends to make me freeze. Actually the high I get from finishing is an important incentive. I love the feeling of putting a story to bed as well as doing the revisions. So that is the payoff for me. And I can not get them any other way except by completing a book. With marketing goals, I think Donald Maass said it best -- it is nearly impossible to determine how much or how little book marketing will do to further your career. It takes a very long time and the things you do today may not make an impact until much further down the road. Much of marketing success is anecdotal. But thinking local and building on past success is always good. Equally, the publisher's role in marketing should not be underestimated -- good distribution, excellent covers, enticing titles and cover copy are all elements in why people buy a book. And the most important thing in book marketing for an author is to remember to keep your shop window full of new quality items. The feelings of satisfaction a reader gets when she finishes your book goes a long way to determining whether or not your next book is an auto-buy for her. It is not all about the marketing, but ultimately all about the content. And this feed backs into the satisfaction I get from reader's letters, and from being able to talk about books. So am I more of a consequence or reward type person? I suspect I am both. But the payoffs are so great when I create something that I am proud of. Most every writer has heard the exhortation -- show, don't tell. And some may heard -- Resist the Urge to Explain (RUE). But why. The basic reason is that as a writer you are trying to allow the reader to draw her own conclusions, rather than hitting her over the head with it. Because I am at THAT stage of my latest ms, I am rereading writing craft books. There is so much to the craft side that skills can need a bit of polishing, and I find it helpful to remind myself of things. Depending on my mood, certain thing resonate with me more than others. Currently, I am rereading Creating Characters by Dwight V Swain. So ultimately, I am not trying to tell the reader the emotion or the motivation. but show it. Or to trust the reader to get the emotion through the context. It is done through being specific and adding little details. Depending on the POV character's mind, what they notice changes. For example, the first snowfall of winter is magical, but when the character is confronted with 70th snowstorm of the winter and is struggling to get home, the snow piles up in sinister shapes and forms treacherous drifts that blow over the road. What a character notices and how they notice it plays a part in forming character. The more specific the writer gets, the more vivid the picture in the reader's mind. So what does that mean for me as a writer -- simply that at times I start with the general, vague and abstract and as I revise I move to the specific, precise and concrete. Everything in a story is present through the filter of a character's POV and therefore they are going to notice what is important to them. Vividness brings a story to life. Explanations and telling can slow the pace to a crawl. But the point at which the writer moves away from telling to showing depends on the writer. In other words, it is okay to write bad pages when writing the first draft. Sometimes, the editing mind doesn't like it, but it works in the long run for me. Eharlequin is running a special buy 3 for 2 book offer this month. Included in the offer are Taken by the Viking as well as Donna Alward's latest --Falling for Mr Dark and Dangerous and Kate Hardy's latest Presents release One Night, One Baby as well as a whole host of other books. It is a great way to save. Oh and e harlequin are doing free shipping to celebrate Canada day and the Fourth of July! Merrimon Crawford has created a lovely site dedicated to reviewing medieval books -- Medieval Book Reviews. She loves the period and is reviewing romance, mystery and general medieval fiction plus books with medieval echoes. As sometimes it can feel like it is an overlooked period, it is good to see someone taking the time and trouble. The other great thing is that she has a definition of a palimpsest on her site. The site's design echoes a palimpsest, so you see the faint echoes of a manuscript behind. The idea of a twice written manuscript really intrigues me. The Smithsonian magazine had a interesting article about decoding the Archimedes Palimpsest in its March 2007 issue. And while not exactly palimpsests, I remain fascinated with the attempts to recover the scorched scrolls from the House of the Papyri near Pompeii. It is the things hidden beneath. The other reason why the idea of a palimpsest is apt is that every book/piece of music/movie contains echoes of the writer's influences. And it can be fun to follow the shadows as it were. Anyway, Merrimon enjoyed Taken by the Viking and has done a lovely review of it. I was especially pleased with her statement: In Taken By The Viking, Michelle Styles has an exquisite sense for detail that transports the reader into the landscape scenes and the community. You can read the rest of the review here.